I was happy that I woke up this morning in time to go to 6:00am spinning. It always makes me feel so good all day. After school I put clothes away from Thanksgiving and did laundry. Then I set to work on dinner. I wanted to try a new recipe so I got some ideas from Eating Well magazine. *This recipe is a general guide, as I just threw ingredients into my mini food processor. Using a food processor, blend arugula, olive oil, water, almonds, parmesan and salt and pepper. When this is all mixed and has made a thick paste, add cottage cheese. This would be great on crackers or on a pizza. I love arugula’s spicy pepper flavor. For dinner tomorrow we are having make your pizza, so expect to see some more arugula! The paste before the cottage cheese – this would be a great cracker spread. The pesto with added cottage cheese, this tastes like cream but without the fat and calories. My meal served with mushrooms, fresh tomatoes, shrimp and kale chips, served on Barilla Pasta Plus! This meal was really good! Next time I would add a little milk or almond milk to the pesto to make it a little creamier so it would stick to the pasta a little better! Let me know if you try it. I LOVE pesto and all things basil! At the moment I have 4 basil plants growing, one in the ground and three in pots. I know, it is a little excessive, but to make pesto you need a ton of basil. This picture is pretty ugly, but you can imagine how delicious this creamy spread tastes! 1 tsp. olive oil – I don’t know if you even need this. Blend everything in the magic bullet or a small food processor. Add more of anything you like. This recipe is based on taste preference. This is wonderful!! I ate it on salad, pretzels, carrots, and a sandwich! So easy to make. Perfect for a party, a snack or a meal! Mix all together in the little mini Cuisineart food processor! For the brides, this is the best kitchen gadget! Make sure you register for it – Crate and Barrel: $29.95 (or something) Way worth it! Thanks Katie!! Unfortunately Brady could not join us for the fun. Isn’t Homeboy cute? So after an energetic day of school, I was craving something warm and filling. I didn’t really have a plan, and we are missing some critical ingredients for our favorite dishes so I had to get creative. I ended up cooking 1/2 an acorn squash and some kashi pilaf to start. I knew these would be good choices regardless of what else I thought up. I then opened a can of lentils and chickpeas. In the meantime, I made some fresh pesto with my entire basil plant. I decided to strip all of the leaves off before it froze and they were no good to use. I then mixed everything together to make one great, fibery, fall dish. Mix all cooked ingredients together and dig in. This is a very veggie dish, and it did not appeal to Brady at all. He ended up making his own pizza with some frozen dough, cheese, chicken and fresh pesto. The pizza was great too! 3. 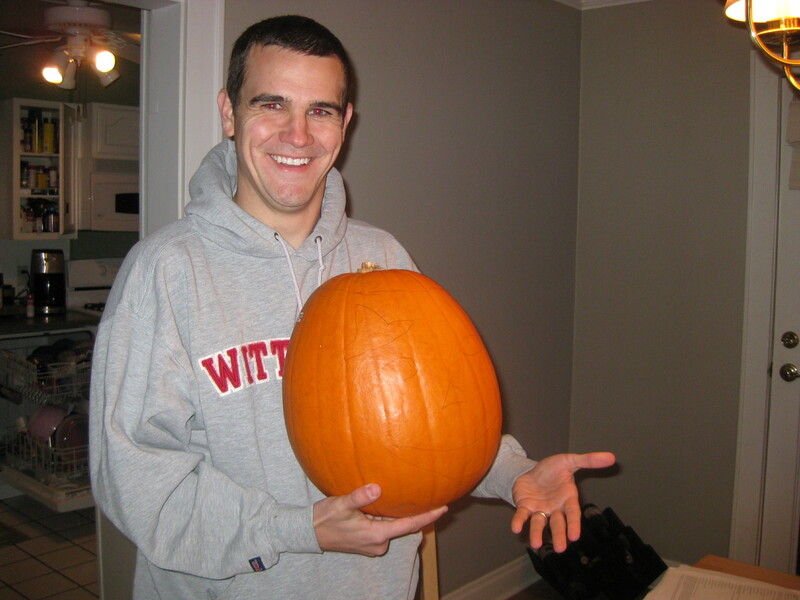 Place the tsp. olive oil and the pam spray in the bottom of a cast iron pan. Heat the pan up. 4. 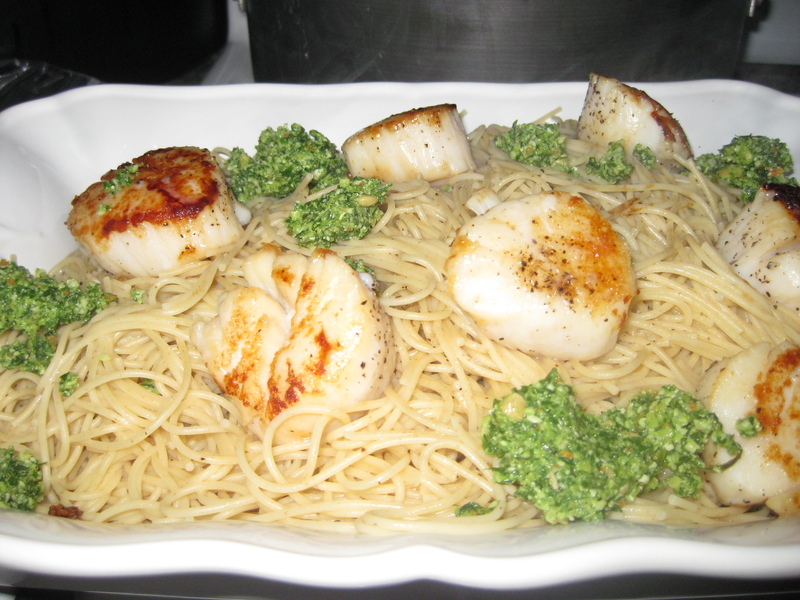 Place scallops on a warm-hot cast iron pan. Do not stir or move them around, it will break them apart. Watch as they cook for about 3 min. After 3 minutes, flip them so they are able to cook and crust on the other side. When this side is done, they are done. To make sure they are done, check to see that the center of the scallop is opaque. 1/4 c. parm. cheese – I would have used a little more, but this was all I had. 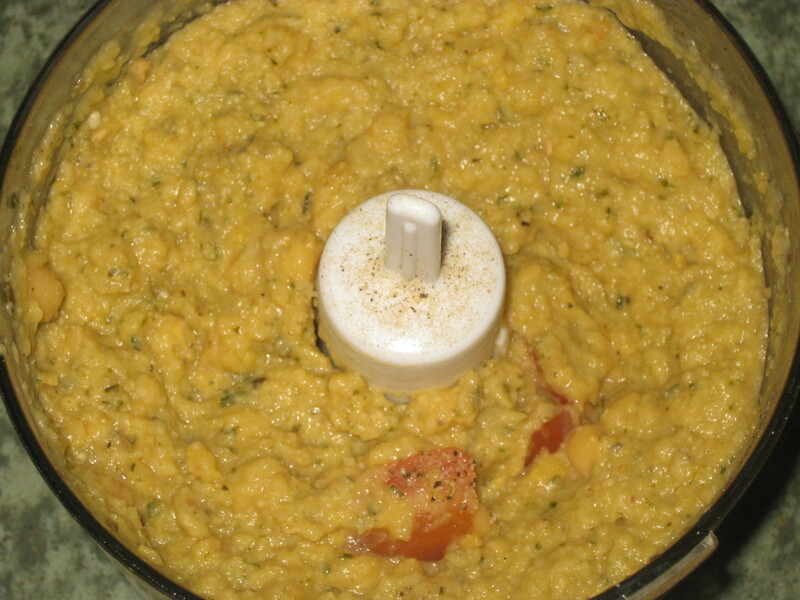 Mix all ingredients in a mini food processor. Blend until completely smooth or to the consistency you like. If you are using the pesto as a pasta sauce, you may want to consider adding a little more oil or adding some plain yogurt to make it creamy. 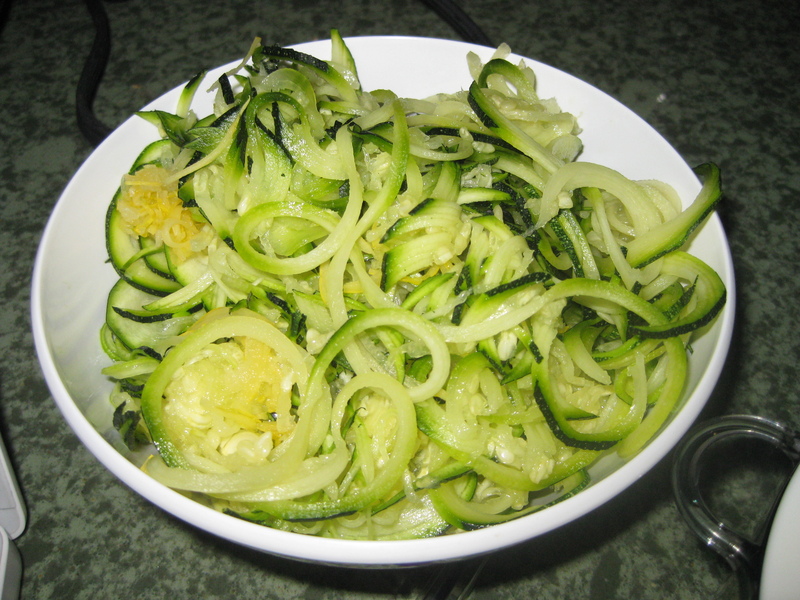 I love to make strands or curls of zucchini and yellow squash with my spiraler. 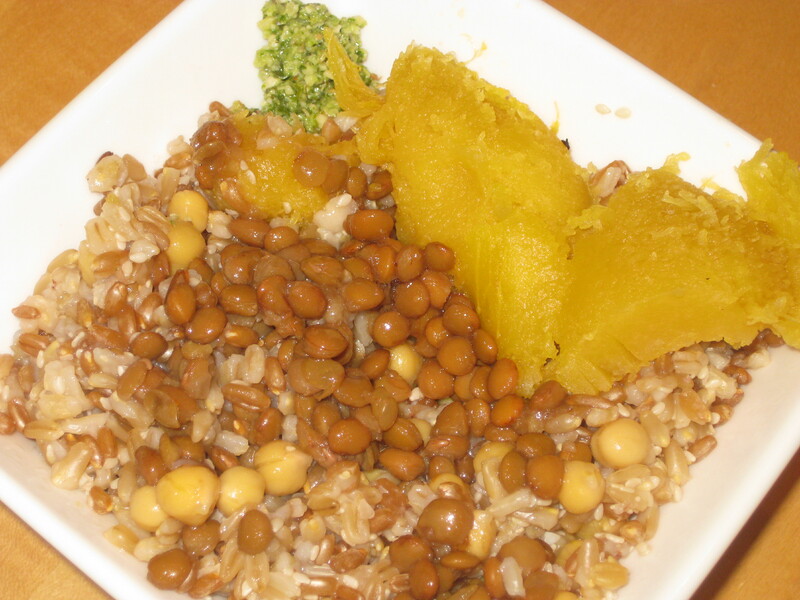 It is a little tool that many people who do a Raw diet use. It allows you to turn cucumbers, zucs, squash and other veggies like that into ribbons or strands, similar to pasta. Here are a few pics of mine. Warning: it is not too pretty!! For dessert: I made a Fage 0% yogurt parfait with blueberries and homemade granola. It was a little late to be eating dessert – 9:30pm but it was soo good! !